A ball of luscious, but very expensive, cashmere yarn followed me home this week. It was one of those things I just had to have. But what to do with it? 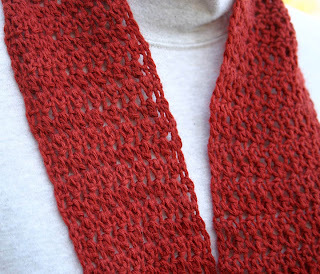 With only 200 yards to work with - no way was I buying more of this, luscious or not - I decided on a long, thin scarf. I wanted something a bit dressy, something a bit different. 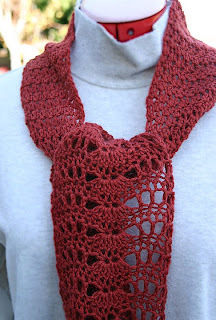 The final result is the Fisherman's Fan Scarf. Divided into 3 sections by weight - so I'd know how much yarn I used in each - section 1 is straight and skinny to keep my neck warm but not overheated. Sections 2 and 3 are a modified feather and fan that flow and drape beautifully. 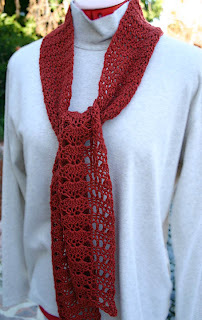 The pattern is on Ravelry (here) or you can download a PDF file here: download now. If you make this, be sure to send me a link or a photo, so I can admire your work.